Committee on Food Security signage on display. Nutrition and food security should be the top development goal as the international community sets its priorities beyond 2015, the target date for a achieving the globally agreed anti-poverty targets known as the Millennium Development Goals (MDGs), senior United Nations officials have stressed. 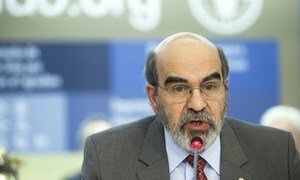 “In line with the UN Secretary-General’s Zero Hunger Challenge, and in close collaboration with our development partners, we agree that nothing less than the eradication of hunger, food insecurity and malnutrition is what we should be striving for,” said José Graziano da Silva, the Director-General of the Food and Agriculture Organization (FAO). Opening the global consultation on hunger, food security and nutrition in the post-2015 development agenda, held in Rome on Monday, Mr. Graziano da Silva urged the international community to commit to the complete eradication of hunger in setting its development priorities beyond 2015. Halving the proportion of hungry people in the world by 2015 was among the targets within the eight MDGs. Some 50 countries are on track to achieve this target, the Director-General noted. Meanwhile, Carlos Serè, Chief Development Strategist of the International Fund for Agricultural Development (IFAD), emphasized that “investing in the sustainable development of rural areas and in inclusive rural growth,” with a focus on smallholder agriculture, is critical for global food security and to the whole post-2015 agenda. The one-day consultation called for including a focus on nutrition in the post-2015 development agenda, as well as for dealing with the different dimensions of under-nutrition and the fast-growing problems of obesity and related non-communicable diseases, according to a news release issued by FAO. It also stressed, among other things, that food security and nutrition represent the cornerstone for progress on other development fronts such as employment, education, the environment and health and in achieving a quality future for humankind, the agency reported. Secretary-General Ban Ki-moon’s Zero Hunger Challenge, first proposed at the UN Conference on Sustainable Development (Rio+20) in Brazil last June, aims for a future where every individual has adequate nutrition. Its five objectives are to make sure that everyone in the world has access to enough nutritious food all year long; to end childhood stunting; to build sustainable food systems; to double the productivity and income of smallholder farmers, especially women; and to prevent food from being lost or wasted. Targets for reducing the proportion of hungry people around the world by half can still be reached if countries step up their efforts to reduce hunger, top United Nations officials announced today.